By the way, why masks? The development of Ocarina of Time was so long, we were able to put in a whole lot of different elements into that game. Out of those, there were ideas that weren’t fully utilised, and ones that weren’t used to their full potential. One of those was the mask salesman8.8. 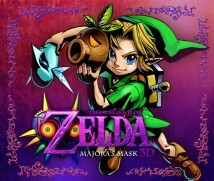 The mask salesman: In the story of Majora’s Mask, he says he is the original owner of Majora’s Mask. He asks Link to retrieve Majora’s Mask, which was stolen by Skull Kid. He may seem laidback, but there is a scary essence about his personality that is hard to read. 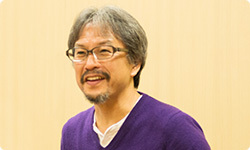 He also acts as a guide for the Japanese Official The Legend of Zelda account (@ZeldaOfficialJP). There’s also a mask salesman that appears in Ocarina of Time, but if they are the same person remains a mystery. When Link wears the masks, sometimes the reactions of whoever he’s talking to change. That’s right. So in Majora’s Mask we felt it would be fun if Link himself transforms whenever he puts on those masks. Before that Link was never able to transform. Right. As a basis of Zelda games, you’re able to use items to do all sorts of different things, and we felt it would be a lot of fun if Link could acquire all these abilities by putting on these different masks. We felt that would expand the gameplay. So we made the game so Link could transform into Deku Link to fly in the air, Goron Link to roll across land, and Zora Link so that he could swim underwater. We also gave each of them a storyline. We did. Once we decided we were going with masks, everything just came into place. Like all the pieces coming together. It must have felt great when everything came into place. That’s true! (laughs) But that goes to show how a deadline’s important. I guess so. (laughs wryly) I’m not saying it’s a case of “a cornered mouse will bite the cat”, but we soldiered on with a mindset that we had to do it. I do know of many situations where things didn’t go well because people were on such tight deadlines. But in the case of Majora’s Mask, it seems to me that having less time actually benefited its development. I guess so! (laughs) At that time we were making Ocarina of Time, wanting to be really proud of our work. We wanted to release it with our heads held high, harking to the world that this is the 3D Zelda game. We really were making the game with all our hearts. Even if it took a long time, we wanted to put in everything we had. As a result of that, you ran into a situation where you made a lot of delicious dishes but had ran out of places on the table to put them on. We did. Because of that, there was a sense of unfulfilment among the staff; a lot of us wanted to do things differently with certain elements from Ocarina of Time, and also wanted to do things they weren’t able to before. If we gathered all new staff to work on it, it would have been impossible to make in only one year. You were fuelled by your regrets of what you made but weren’t able to fully use to fruition. Because you were fuelled by it, you were able to put on a bunch of new ideas on top of the “Three-Days System” and they all fit together nicely. That’s why you were able to make something with so much content in only a year. I suppose so. Also… I was younger back then. I also remember telling him, “We’ll definitely make this in one year!” Looking back at it now, I said something unbelievable to my boss! Yeah. Miyamoto-san did tell us to make it in a year, but he must have been concerned towards the end. He must have been worried that you were all exhausted. I suppose. And at that time, I did have a sense that I was being pushed on by something strange. I had a dream about it. What kind of a dream was it? It was a dream about being chased by a Deku. movie for the Dekus, so I had him show it to me… and that movie was exactly like my dream!9. Takumi Kawagoe: Works in the Software Planning & Development Department of Nintendo. He was in charge of Cinematic Sequences for The Legend of Zelda: Majora’s Mask for the Nintendo 64 console. He appeared in Iwata Asks: Twilight Princess and Iwata Asks: The Legend of Zelda: Ocarina of Time 3D Original Development Staff Part 1. I even told him “how do you know my dream?” (laughs) That’s how on-edge I was back then. Perhaps you were possessed by something. By the way, the reactions when we announced The Legend of Zelda: Majora’s Mask 3D10 was amazing, right?10. Announcement of The Legend of Zelda: Majora’s Mask 3D: The release of this game was announced globally in Nintendo Direct 5/11/2014. We never worked on a remake for Majora’s Mask until now, so we did go in thinking that the reactions would be somewhat positive. But to be honest, the reactions we received were much stronger than we had anticipated. Why do you think that was the case? I think that’s because Majora’s Mask is the kind of a game that presents players with a challenge. 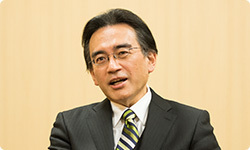 When we talked about The Legend of Zelda: Ocarina of Time 3D11 in a previous Iwata Asks, we talked about hospitality.11. The Legend of Zelda: Ocarina of Time 3D: An action adventure game released for the Nintendo 3DS console in June 2011 in Europe. It was about “hospitality on the attack”12.12. Hospitality on the attack: Mentioned in Iwata Asks: The Legend of Zelda: Ocarina of Time 3D Original Development Staff Part 2. The developers stated that when they replayed Ocarina of Time for Nintendo 64 to get references for remaking the game for Nintendo 3DS, they mentioned that they “sensed an immense amount of hospitality” when they played through it for the first time in a while. It shifted from hospitality to a challenge. That might be true. When I played the game when it came out, it was like the game itself was screaming out to me, questioning whether I had the dedication to push forward. That’s because we didn’t put in any kind of elements where we show people how to play this game. The game was made for those who had played Ocarina of Time, so I felt like there wasn’t a need for step-by-step instructions. It was like “clear it if you can”. So those who have played it still strongly remember how the game felt like it was a challenge, even though 15 years have passed. That’s probably why it led to such a strong reaction. I see. Well, let’s stop talking about the Nintendo 64 version, and start talking about this new game.